The left lane of Route 110 east and westbound under I-95 in Amesbury will be closed overnight on Monday, June 8 through Thursday, June 11. Drivers are encouraged to avoid the area and seek alternate routes to minimize delays. Those traveling through the area should expect delays and should reduce speed and use caution. The closures will allow MassDOT to demolish the existing pier and perform construction work. 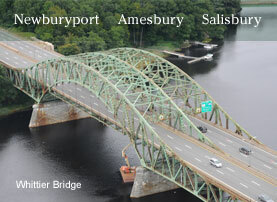 Built in 1951, the bridge over the Merrimack River connects Newburyport and Amesbury. When the project is complete, the new bridge cross section will include four travel lanes, a high speed shoulder and a breakdown lane in each direction. Four adjacent bridges are being replaced or reconstructed along a 3.5 mile segment to accommodate a widened Interstate 95 from Exit 57 in Newburyport to Exit 59 in Salisbury.